Also known as embroidery and microstroking, microblading is feather touch and hair like strokes that are drawn onto your skin. It is a form of semi-Permanent Makeup that provides a means to partially or fully camouflage missing eyebrow hair with the appearance of simulated hair. Great solution for those with sparse, thin and overplucked eyebrows. Those who have experienced hair loss. Those who’d like to refine and reshape their brows. 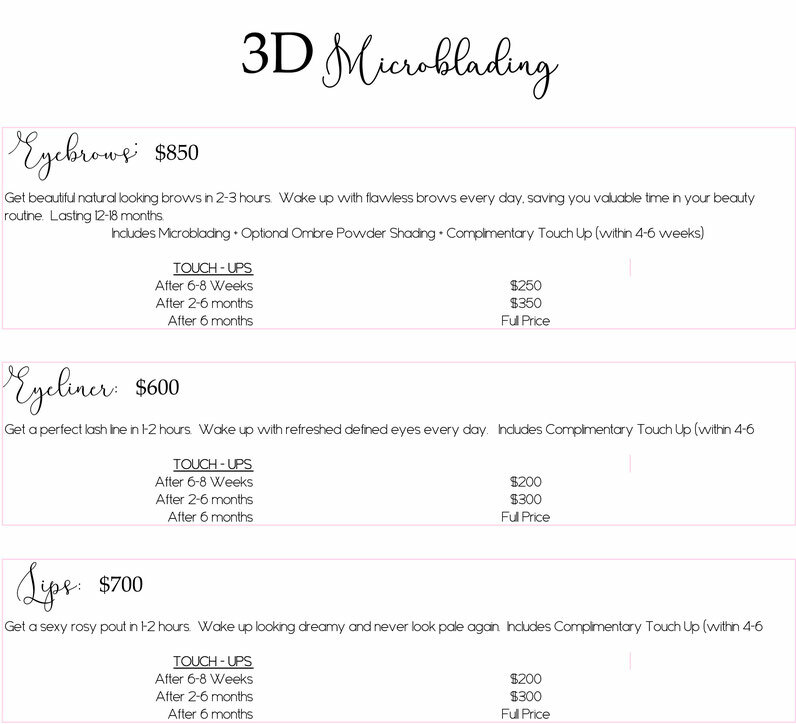 Depending on your skin type, microblading lasts 12-18 months. We use natural, mineral based pigments. Our pigments are hypoallergenic and completely safe for the body. Because this is a semi-permanent procedure, the ink will not change colors as in previous permanent cosmetic procedures and will also fade over time. Simplify your beauty routine and save valuable time getting ready. Wake up with natural looking eyebrows everyday. Because this is a semi-permanent cosmetic procedure, you have the ability to change your shape along with the ever changing beauty trends. *Consultation is needed prior to treatment. Full medical history must be disclosed.